Over at the Worlds of Law blog, Mark Weiner has posted another video interview with me, titled “The Beauty of the Code.” Mark asked me to speak about some of the famous codes in our collection, such as the first edition of the French Code Civil (1804) shown below, better known as the Napoleonic Code. Among other things, I owe Mark Weiner thanks for putting me on the same screen as Marlon Brando. Who knew that his character Stanley Kowalski, from the movie version of Streetcar Named Desire, was an expert on the Napoleonic Code? The star of the gallery is the portrait at right, of Paolo Attavanti (1445?-1499), generally considered to be the very first author portrait to ever appear in a printed book. The woodcut appears in a summary of canon law that Attavanti authored, Breviarium totius juris canonici (Milan: Leonhard Pachel and Ulrich Scinzenzeler, 28 Aug. 1479). As such, it is the granddaddy of the author photos on today’s dust jackets. Attavanti was a monk of the Servite Order and a well known Florentine theologian. His Lenten sermons, inspired by Dante’s Divine Comedy, were published by Pachel and Scinzenzeler a few weeks after the Brevarium with the same portrait. The “Portraits: legal authors” gallery joins three other portrait galleries in the Flickr site: portraits of Hugo Grotius, portraits of Modena jurists published in Dottori Modonesi (Modena, 1665), and portraits of Italian jurists in Illustrium iureconsultorum (Rome, 1566?). For a guide to finding legal portraits online, you can do no better than “The telling image: searching for portraits of lawyers”, a recent post on the Rechtsgeschiedenis Blog by my friend and colleague Otto Vervaart. In his typically thorough and informative fashion, Vervaart reviews portrait collections on both sides of the Atlantic and gives helpful suggestions on search strategies. Association of the Bar collections are finished! The German Law Collection of the ABCNY (678 titles in 856 volumes). The collection arrived in September 2007. Fourteen of the titles are the only North American copies reported in OCLC, including the oldest: Ludwig Fruck's Teutsch Formular (Strassburg, 1529). Another, Civitatum Hanseaticarum Ordinatio nautica et jus maritimum (Hamburg?, 1660? 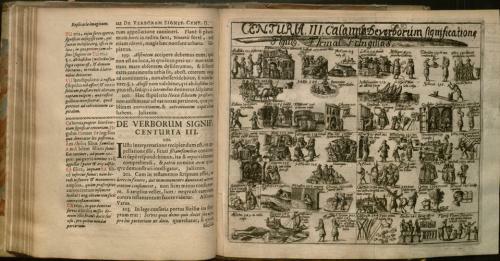 ), the maritime laws of the Hanseatic League, is an apparently unrecorded edition. Well over 500 of the titles were part of the law library of Konrad von Maurer (1823-1902), a leading historian of early Germanic and Nordic law. The Foreign Law Collection of the ABCNY (186 titles in 271 volumes). This collection was acquired in October 2008, as part of a cooperative effort with the Jacob Burns Law Library, George Washington University. The collection's title hints at its eclectic contents. It contains significant holdings of Italian, Flemish, Dutch, and Spanish law, additional titles in Roman, canon, and German law, and law books from jurisdictions as diverse as France, Mexico, Russia, Sweden, Ireland, and Bengal. There are some truly rare books here. The OCLC database reports only one other copy of the 1530 edition of the Practica Papiensis printed in Lyon by Fradin (Berlin State Library), and the 1507 Cologne edition of Petrus Ravennas's Compendium juris pontificii (Columbia University). One of my favorites is pictured below, Johannes Buno's Memoriale Institutionum juris (Ratzeburg, 1672), a textbook on Justinian's Institutes that employs a complex system of illustrated memory aids. Thanks to the Law Library's outstanding cataloger, Susan Karpuk, for her fine work. Thanks again to the Yale Law School's Oscar M. Ruebhausen Fund for funding these acquisitions.